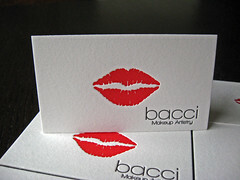 Red letterpress lips make these cards pop! 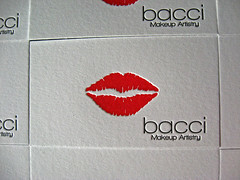 We finished up these cards a few weeks ago for Samantha, the artist behind Bacci Makeup, and thought they were pretty cool. 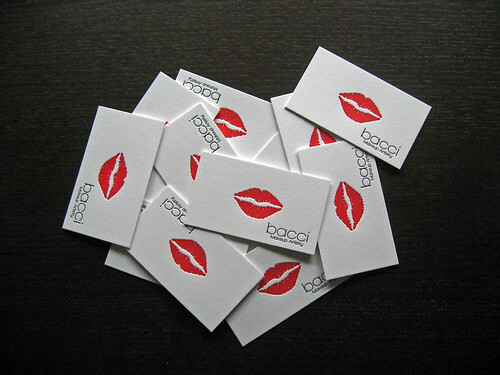 Everyone needs/uses business cards for different things, some put them in with letters to clients, others put them in local stores for patrons to pickup, a few like them so much they never give any away, and probably most hand them out one-by-one to people they meet. 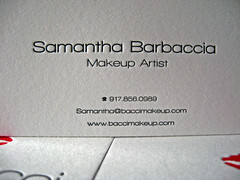 Samantha had a trade show to attend and wanted business cards that people would hold on to. 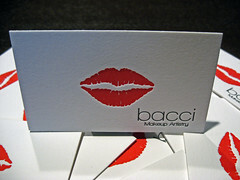 Samantha sent us the design she wanted printed, we worked back and forth through a couple of iterations to nail down the final piece which you see here. 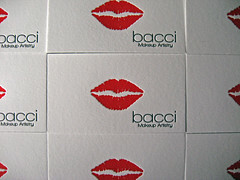 The cards was double sided with the logo prominently displayed on the front, and her contact information on the back. 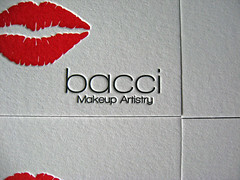 We letterpress printed each side on 110lb Crane’s lettra (fluorescent white) and duplexed the sheets. 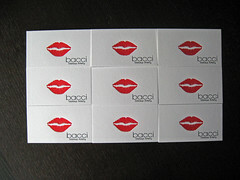 Duplexing ensures that each side gets a great impression, especially the lips on the front. 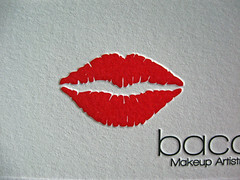 We custom mixed a pantone color for the red lips trying to mix that perfect rich red lipstick color. 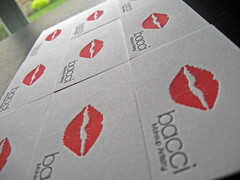 The contact information text on the back was quite small, so we minimized the impression on the text. 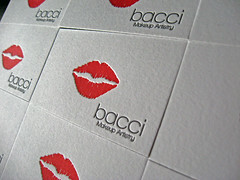 With such small text, the photopolymer can’t usually stand up to heavy impression.